While off-grid renewable energy systems are often more economical than diesel generators or transmission line extension in rural areas, they are more expensive than grid-connected renewable energy systems, which don’t require batteries and other balance of system equipment. 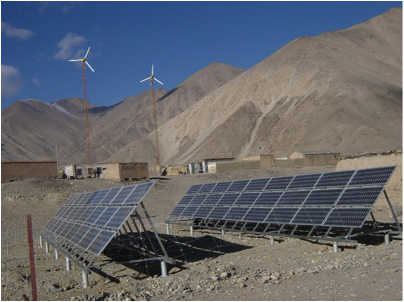 Wind and solar resources are complimentary both seasonally and diurnally, and off-grid hybrid wind/solar systems provide better system reliability, more uniform power generation, and reduced depth of battery discharge. Resource and load matching is critical for off-grid system design. 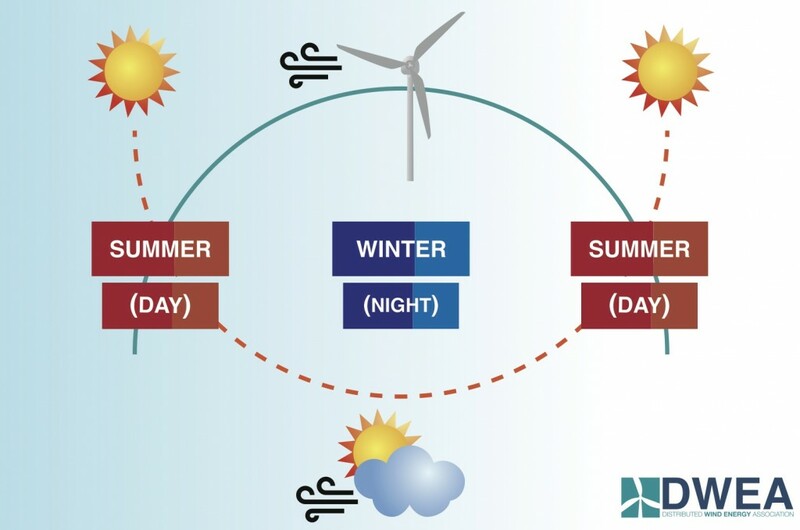 Wind Resource: The wind resource analysis should be focused on solar assistance, which is during winter months when wind is at its peak. Most regions of the United States have sufficient winter winds to support most off-grid power needs. Solar Resource: In locations such as the Great Lakes region or Canada with shorter and/or cloudier winter months, off-grid systems should have much larger wind capacity. In cloud-free locations at less than 35 degrees latitude, such as Arizona, wind can comprise a smaller percentage of total power generation since winter solar availability is high. Load Specifics: Energy loads that are necessary in the winter and at night should have a much higher wind component. A prime example is hybrid lighting, where the load is increased in the winter (due to longer nights) and where energy is only needed at night when wind power generation can occur and solar power generation cannot. Variety of loads: lighting, refrigeration, small appliances, etc. A system that incorporates both wind and solar inputs will require a considerably smaller battery than one with a sole power source of either option. Hybrid systems extend the life expectancy of a standard lead-acid battery bank due to the consistent flow of energy not allowing the system to drop below the recommended 50% depth of discharge. Battery technology is improving rapidly to allow for longer product lifespans and less significant discharge issues. Other types of batteries to consider include lithium-ion, zinc-bromine, and liquid tank or flow batteries. Hybrid systems allow for year-round energy supply and consistency. The key is to determine which resource is available more often and during which times (winter/summer & day/evening). This will allow for the design of a system that maximizes on optimal energy supply and focuses on long-term life and usage. 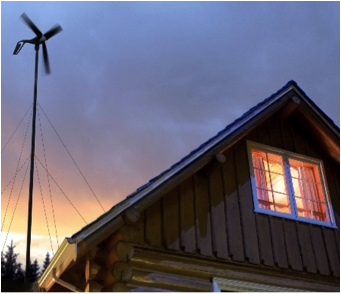 The average cost of and return on investment for off-grid distributed wind systems varies greatly and depends on the size of the system and types of equipment used. For more information on off-grid distributed wind turbines, please visit our FAQ page and consult the manufacturers listed below.